As mentioned previously in this website, the most successful prevention strategy against the West Nile virus is to avoid mosquito bites. If you will be outside during evening, nighttime and dawn hours, consider the use of an insect repellant containing 10% or less DEET (N, N-diethyl-methyl-meta-toluamide) for children and no more than 30% DEET for adults. DEET is effective for approximately four hours. Avoid prolonged or excessive use of DEET and use it sparingly to cover exposed skin and clothing. Do not use DEET on infants or pregnant women and do not apply DEET directly to children. Apply it to your own hands and then put it on the child. Always use DEET according to the manufacturer’s instructions. Do not apply to infants under 2 months of age. Apply repellents only to exposed skin and/or clothing, but do not use under clothing. Applying repellant to clothing offers added protection with less potential for exposure. Do not apply to eyes and mouth, and apply sparingly around ears. 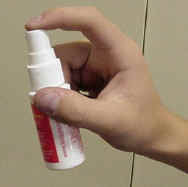 When using sprays, do not spray directly onto face; spray on hands first, and then apply to face. Do not spray in enclosed areas. Avoid breathing a repellant spray, and do not use it near food. 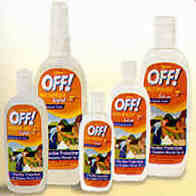 Use just enough repellant to cover exposed skin and/or clothing. Heavy application and saturation is generally unnecessary for effectiveness. After returning indoors, wash treated skin with soap and water or bathe. This is particularly important when repellants are used repeatedly in a day or on consecutive days. Also, wash treated clothing before wearing again. If you suspect that you or your child are reacting to an insect repellant, discontinue use, wash treated skin, and then call your local poison control center. Remember that Vitamin B, ultrasonic devices, incense and bug zappers have not been shown to be effective in preventing mosquito bites. Larvicides can be used to control mosquitoes in the aquatic stage before they become biting adults. This type of control generally has the least effect on non-target species and the environment. Microbial larvicides such as Bacillus thuringiensis var. israelensis and Bacillus sphaericus can be used successfully in a broad range of freshwater habitats. Biochemical larvicides (insect growth regulators - IGRs) such as methoprene can also be used in a variety of habitats. Mono-molecular surface film larvicides can be used in polluted or artificial habitats, but should not be used where non-target insects are important resources. Mosquito adulticides should be considered the least desirable method of control and only used when isolations of virus and/or evidence of disease has been established. These materials have strengths and drawbacks that will influence which material is most appropriate for a given situation, and all must be applied according to label directions. Currently available adulticides include organophosphates, pyrethrins, and pyrethroid-based insecticides. These may be applied by hand-held, or backpack, foggers, or fixed-wing or rotary-wing aircraft. Application of adulticides by truck-mounted foggers, fixed-wing or rotary-wing aircraft is usually done by government agencies or private contractors. Those who apply pesticides in these ways must be licensed, have their equipment properly calibrated, and adhere to the label directions.